A proper 3D printed Mars habitat would not only make the lives of the first colonists easier, but also it could ensure their safety. The NASA contest focuses on safety, human exploration, and of course colonisation. The best design for a printable Mars Habitat will receive $2.25 million– but this is no easy feat to achieve. There are so many factors to take into consideration, and to be honest, you can’t exactly predict what’s going to happen on a planet you’ve never been too. Sure, you may guess, and speculate, but we’re talking about human lives here. NASA is also looking to reduce the costs of materials needed, and to reduce the amount of materials needed to built shelters on location. 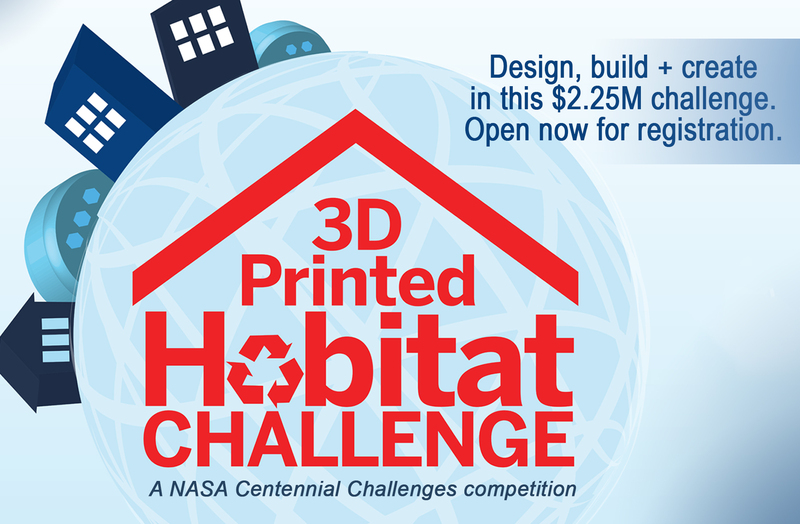 Participants in the The 3D Printed Habitat Challenge will need to demonstrate how someone can actually build their design – quick, and sturdy are pluses. NASA’s contest has 3 phases. It’s all about the habitat’s design – no, they aren’t looking for that gorgeous architectural design, they are looking for efficiency. In this phase, participants are tasked to take advantage of what 3D printers offer. 30 plans will be selected to move to the next phase, and the winner of the first round will receive a $50,000 cash prize. The Structural Member Competition is the next round, and it focuses on building the habitat from what materials can be found on the landing site – discarded parts from spaceships, and other resources that can be found on arrival. In order to do so, we need advanced fabrication technologies – not only those that come with added capabilities have the possibility of moving on, but also those who reduce the cost of materials needed, and are quick to build. The last round consists of members actually showing NASA how they would construct their design on Mars utilizing the 3D printed technology. It is yet unknown if participants will be needed to construct their habits in a setting that will emulate Mars exactly. The winner of phase 2, and phase 3 will receive a $1.1 million cash prize. For more information about the contest and its rules go to the official website. We all know how shelter is important, and on Earth we consider it to be a basic necessity – unfortunately, we don’t consider it a basic human right, but maybe soon mankind will solve this mystery. Building proper shelters on Mars is a top priority to colonists, and if they are poorly made it could mean the death of our pioneers. Everyone is urged to compete in NASA’s contest – amateur, and professionals alike. You may send submissions until August the 3rd, and the competition will run through September the 27th at the New York Hall of Science. “If we can solve for the need to ship materials, we can develop solutions for a variety of scenarios, including those for humanitarian and disaster relief efforts on earth, wherever affordable housing is needed and access to conventional building materials is limited.” the National Additive Manufacturing Innovation Institute has reported on their official website.